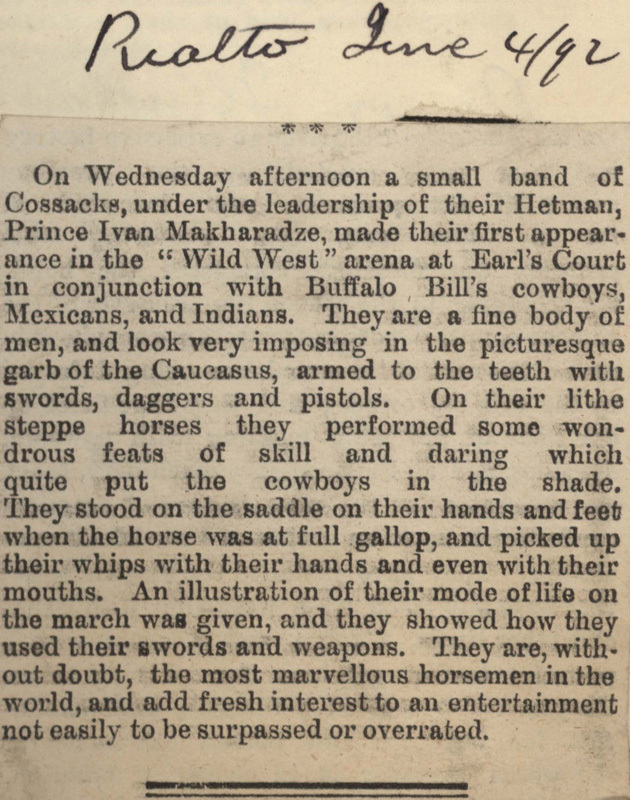 On Wednesday afternoon a small band of Cossacks, under the leadership of their Hetman, Prince Ivan Makharadze, made their first appearance in the "Wild West" arena at Earl's Court in conjunction with Buffalo Bill's cowboys, Mexicans, and Indians. They are a fine body of men, and look very imposing in the picturesque garb of the Caucasus, armed to the teeth with swords, daggers and pistols. 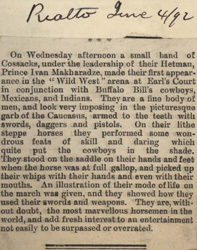 On their lithe steppe horses they performed some wondrous feats of skill and daring which quite put the cowboys in the shade. They stood on the saddle on their hands and feet when the horse was at full gallop, and picked up their whips with their hands and even with their mouths. An illustration of their mode of life on the march was given, and they showed how they used their swords and weapons. They are, without doubt, the most marvellous horsemen in the world, and add fresh interest to an entertainment not easily to be surpassed or overrated.